I stay away from political issues here on the blog. It just doesn’t make sense because this blog is about food, cooking, tools, etc. But I feel compelled to break that for this post only. I think we should pass NAFTA. Yeah, I know. I’m 21 years behind the time. Back in the early to mid 1990s, the North American Free Trade Agreement that made trade between Canada, Mexico and the United States much more open was a BIG political deal. Would it grow jobs? Would it just relocate them? Everyone had an opinion. Looking back more than 20 years after its passing, the agreement has been great for foodies and cooks. Years ago if a fruit or vegetable was out of season for your area, you hoped you could get it from another place (California, Florida, etc…). Many times, however, it just wasn’t available. No watermelon in February. No raspberries in April. Once the borders opened for the greater flow of produce, almost every piece of produce became available year-round. See an interesting article about it here. There are some that will argue that this availability has been bad. Their argument is based on mass-produced fruit and vegetables are often bred for shelf life (which is even more important the further it travels) and not for flavor. They argue that not buying local hurts the environment. They argue that we are not supporting local farmers. See that argument here. All of their arguments may be true, so when I can find it available, I buy local. I try to buy heirloom tomatoes for their flavor. But my local farms are covered in snow 1/4 of the year and are not harvesting much for another 1/2 of the year. So I love that I can make what I want, when I want. 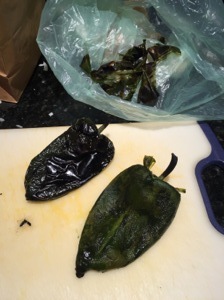 This NAFTA thing allowed me to get these poblanos in the dead of winter. 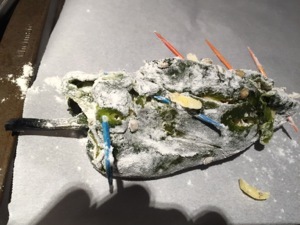 This is not a quick dish to make. No, this is not my lunch. Let the peppers steam in a bag after roasting. It helps you remove the skins. Take out the ribs and seeds. 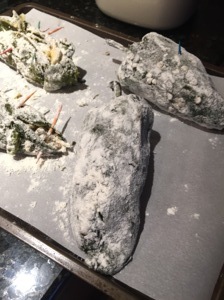 Try to flour and seal them. The sealing thing is rough. 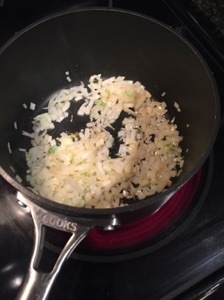 The onions for the sauce. OK, so they are not perfectly shaped. 1. Preheat the oven’s broiler and set the oven rack at about 6 inches from the heat source. 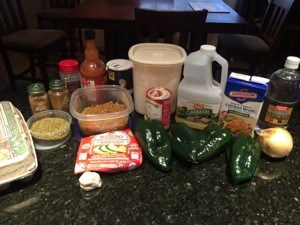 Line a baking sheet with aluminum foil, and place the peppers onto the prepared baking sheet. 2. 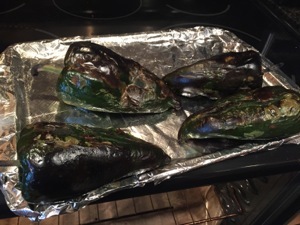 Cook under the preheated broiler until the skin of the peppers has blackened and blistered, 8 to 10 minutes per side. 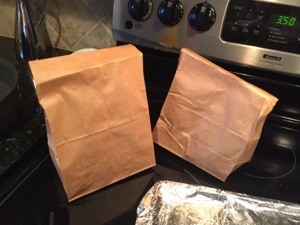 When the peppers are about 80 percent blackened, place them a plastic bag, seal, and allow the peppers to steam as they cool, about 20 minutes. Once cool, remove the skins and discard. Cut a slit lengthwise into the side of each pepper, and remove seeds and veins. To reduce spiciness, rinse out any remaining seeds with water. Pat the peppers dry with paper towels. 3. Mix together the shredded mozzarella, Monterey Jack, and Cheddar cheese in a bowl until thoroughly blended. Divide the cheese into 4 portions, and squeeze each portion lightly in your hands to make a cone shape. 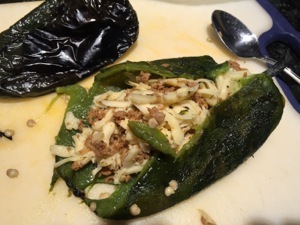 Insert a cone into the slit in each pepper, and pin the openings closed with toothpicks. Dredge each pepper in flour, dust off the excess, and place on a small baking sheet lined with parchment paper or waxed paper. Place the peppers in the freezer for at least 30 minutes. 4. 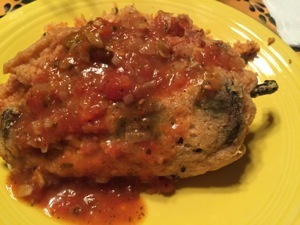 To make sauce, blend the stewed tomatoes in a blender until pureed, and set aside. Heat 1 tablespoon of vegetable oil in a saucepan over medium heat, and cook and stir the onion until translucent, about 5 minutes. Add the garlic, cook and stir for about 30 seconds, and pour in the pureed tomatoes, chicken broth, vinegar, oregano, cumin, black pepper, hot pepper sauce, and cinnamon. 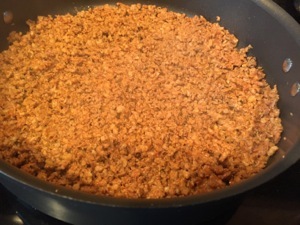 Reduce to medium-low, and simmer the sauce until reduced by half and thickened, about 20 minutes, stirring often. 5. Preheat an oven to 200 degrees F (95 degrees C), and warm a platter in the oven. 6. 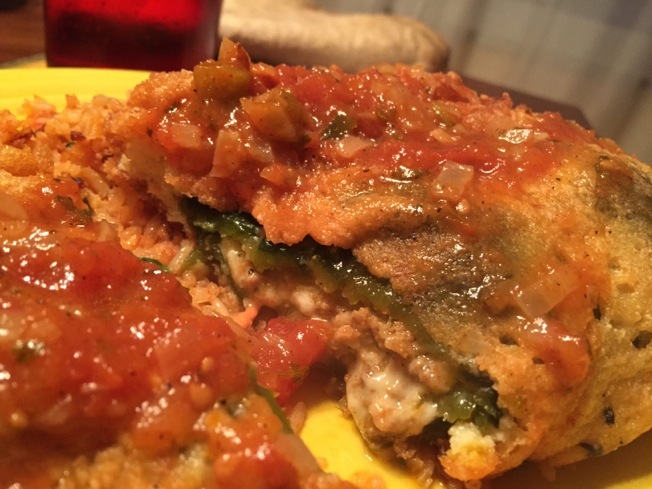 To make batter and finish the chiles rellenos, mix 1/3 cup flour with salt in a bowl. In a separate bowl, beat the egg whites with an electric mixer until the whites form stiff peaks. 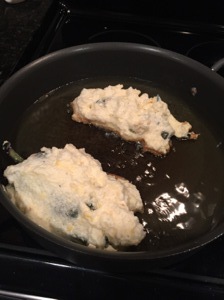 Lightly mix the egg yolk and flour-salt mixture into the egg whites to make a fluffy batter. 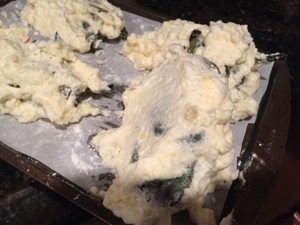 Remove peppers from freezer and coat them in flour again; shake off excess flour, and dip each pepper into the egg batter, using a spoon to gently but completely coat each pepper with batter. 7. 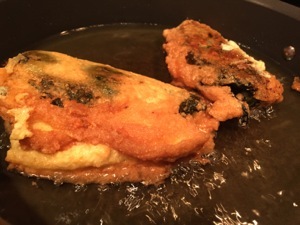 Heat frying oil in a heavy cast iron skillet over medium-high heat until the oil shimmers. Gently lay the coated peppers into the hot oil, and fry on both sides until the batter is golden brown and the cheese filling is hot, about 5 minutes per side. 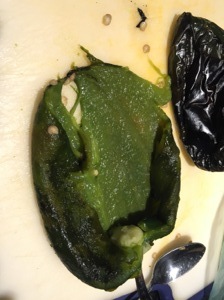 Remove peppers to warmed platter while you finish frying. 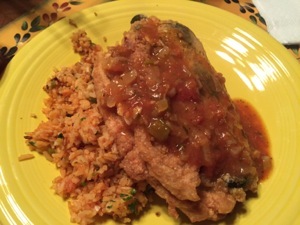 To serve, ladle a generous spoonful of sauce onto plate, and place pepper on sauce. Serve peppers hot with a dollop of sour cream.